In October of 2011 we spent a few days and nights down in Wildwood, New Jersey and decided to try out the Dragon's Lair Miniature Golf Course which is a Glow-In-The-Dark mini golf course that is a lot of fun to play! You'll find this place directly on the Wildwood Boardwalk. We felt it was reasonably priced and we didn't have to wait in any long lines since we played at 10:30 pm at night. Our only complaint was that we wished there had been more holes to play and that they would of been a little more challenging for us. In addition, the admission clerk was inpatient & a little rude with us when we had asked him a few questions about the course. Sigh. 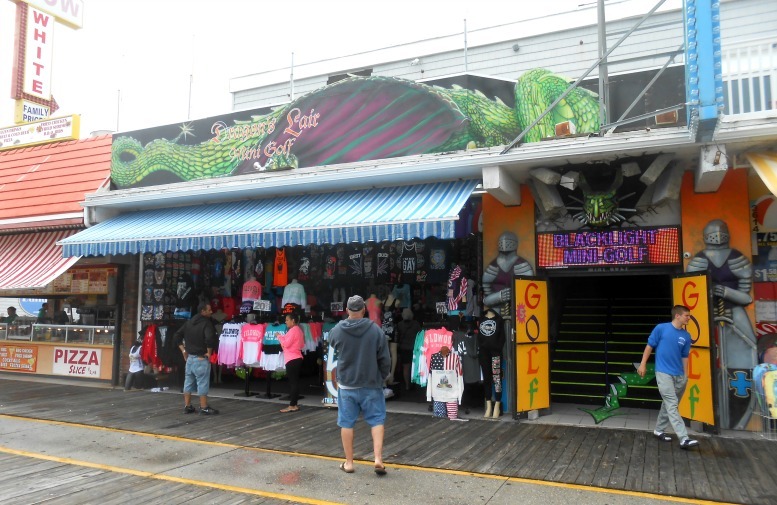 The Dragon's Lair Miniature Golf is located right on the boardwalk in Wildwood and is open during the in-season months. Since it is really dark inside we don't recommend that you take really small children in there as we did see a child about 5 years old who was scared and had to be taken out. When I say scared, he was wailing. About 10 minutes later, we saw an even younger child in there who wasn't thrilled to be there either. If you have small toddlers who are afraid of the dark, this probably isn't the mini golf course for you. There were 4 people in our party and it took us about 35 minutes to play but like I said, there were no long lines and no one immediately in-front of us. We've played here before and at times, they get really crowded and it can take you longer to get through the course. We are looking forward to playing it again in the summertime when we head back down to Wildwood to see if there were any improvements or changes from the last time. We do recommend that you check it out if you love playing mini golf, especially if you're looking for a place to play right on the boardwalk.